We begin the unit by setting the stage for inquiry into the Age of Exploration. By reflecting on what we think we know and letting our imagination and curiosity roam, we can develop questions that will guide our investigation. What do you think you know about the Age of Exploration? 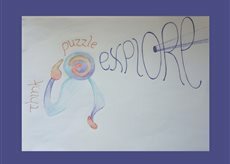 What does the topic make you want to explore? 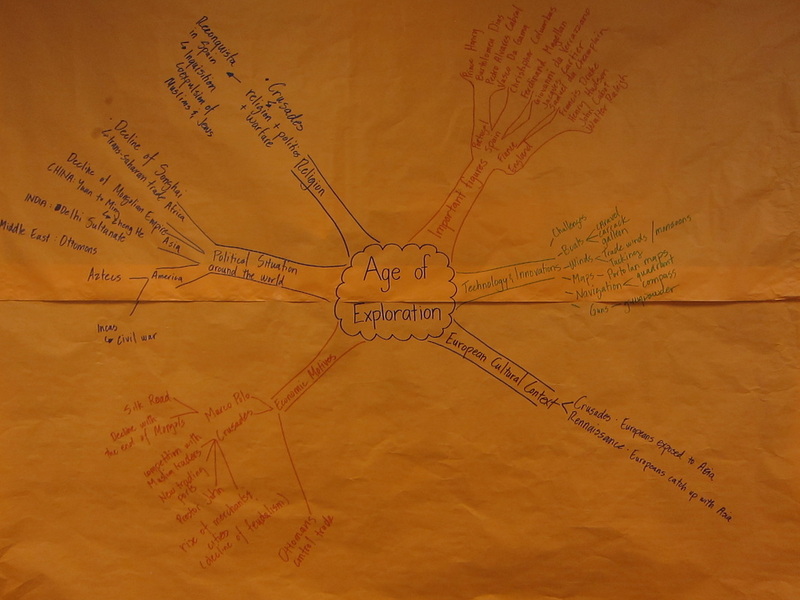 Classes will collaborate to find primary and secondary resources to guide our inquiry into the Age of Exploration. We will share online resources with one another by using our class wiki. Everyone should find one primary source and one secondary source, create link for each on the wiki and write a sentence summary of how that resource supports your inquiry into the Age of Exploration. Join the wiki using the Code JKDDDDJ, so you are able to add links to the wiki. Students need to be able to distinguish between a primary and secondary sources in order to appreciate the strengths and weaknesses of different sources of information. The first day will consider difficulties around sourcing--different people, different stories and reliability. We continue to exercise historical thinking skills by examining the evidence, putting it into context and considering the reliability of the different sources. Students will write a letter to the parents explaining what happened and the actions they are taking as a principal. Students will need to corroborate the stories to explain what happened by providing evidence and context for the fight. This will provide the background for the decisions they are taking to resolve the problem. Students will use the resources they recorded on the wiki to develop a timeline event for their topic. It should be unique to what they found and not duplicate other students work. On a large note card or a 1/3 sheet of paper students should have 5 elements. While the class as a whole is examining the major question about the causes for the Age of Exploration, each student has been assigned a group with a specific critical question. Who were the major figures during the Age of Exploration? What were their accomplishments? What impact did they have? What technology and innovations supported the Age of Exploration? How did the European cultural context impact the Age of Exploration? What was the economic drive for the Age of Exploration? What was the political situation in Africa before the Age of Exploration? What was the political situation in Asia before the Age of Exploration? What was the political situation in the Americas before the Age of Exploration? How and why did the religion become an important part of the Age of Exploration? After writing down their Critical Question, each group will form supporting questions that will help them answer their critical question. As they research answers to their supporting questions, students will document important terms and providing an explanation of them. Africa: What was the social and political impact of Africa on European exploration? Asia: What was going on in Asia that Europeans wanted to get there? What makes the European explorers different than Zheng He? Americas: Why is Columbus so significant if he was not the first European to reach the Americas? What did that mean for the Americas? Students will continue to do research on their assigned topic. After answering their supporting questions, students will then be able to answer their main question. Likewise, students will be able to consider the topics importance and relevance. Having become experts on their subject, students will prepare a presentation on their learning. It can be a poster, slides or other creative expressions. It should include the main argument, supporting evidence, and important vocabulary. Students have collaborated through the last couple weeks through a wiki page and a presentation. Now students will reflect on their experience by answering the following question. What was your experience of collaboration? How do you hope to improve in the future? 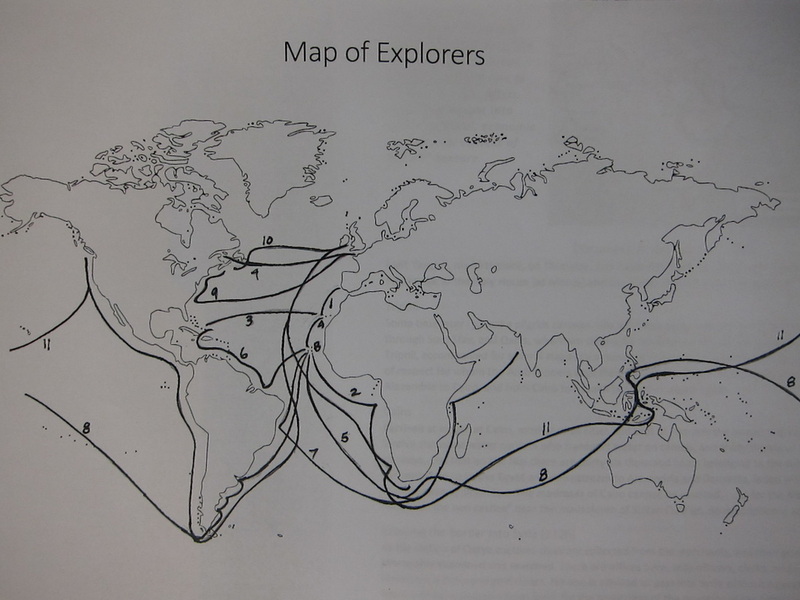 Students will map out the connections between the various topics that were explored during our inquiry into the age of exploration. Students will examine the various economic zones of the Middle Ages to better appreciate the situation around the world and their interconnections. Students will use the navigational instrument explorers determined their latitude. Students will identify developments in cartography and appreciate cultural priorities through the maps they created. The various strands that have been explored are brought together in a mini-lecture. Here the political, economic, cultural, religious and technological strands are brought together.